While I’m a big fan of federalism, this isn’t because I have a starry-eyed view of non-Washington politicians. Of course there is plenty of grotesque misbehavior by state and local governments. And it’s most troubling when it involves law enforcement and the legal system. David French of National Review has a very powerful and compelling article about thuggery at the local level. …my experience with small-town government…pushed me in a libertarian direction before I even knew what a libertarian was. The public schools were dreadful. Focused on patronage more than education, the school system was a public jobs program… Our local government’s core mission was dispensing favors. If you were part of the local elite, the normal rules of life simply didn’t apply. Speeding tickets? No problem. You need a conditional use permit? You got it! …if you were poor or lacked connections, “the rules” applied to you with a vengeance. After all, someone had to pay the city’s bills. There was no escaping speeding tickets, zoning officials were ruthless, and each interaction with the unyielding authorities carried with it the threat of immediate escalation, sometimes without justification. Some of the folks who protest police mistreatment see the issue through the prism of race, but maybe the real problem is that cops are expected to generate revenue for local politicians. …It is entirely possible to believe (as I do) that the evidence indicates that “hands up, don’t shoot” is a fiction, even a malicious fiction, while also believing that the evidence indicates that Ferguson’s government was corrupt in exactly the way that government is typically corrupt. We often take for granted the rule of law. If you are blessed to live in a town where the officials are relatively clean, or if you’re among the class of people that officials fear to cross, then public institutions seem benign — helpful, even. But there are millions of our fellow citizens who live a different reality, under the authority of different kinds of public officials — officials who view them as virtual ATMs, regardless of their ability to pay. And when the government imposes that mindset on police officers, forcing men and women who are trained to respond to (and anticipate) the most violent incidents to essentially become the armed tax collectors of a corrupt system, then that government is unjust. Amen. Eric garner is dead today because New York City has cops act as deputy tax collectors. Speaking of mistreatment and abuse, Debra Saunders has a must-read account of California’s immoral system for pillaging drivers. California is filled with people who are one traffic ticket away from losing their means of independent transportation. They get a ticket for a busted tail light or a small-change moving violation. On paper, the fine is $100, but with surcharges, it’s more like $490. People who cannot pay often do not show up in court — which drives up the cost. According to the Judicial Council of California, about 612,000 Californians have suspended driver’s licenses because they didn’t pay fines. In 2013, more people — 510,811 — had their licenses suspended for not paying fines than the 150,366 who lost their licenses for drunken driving. “For a lot of people, the car is the only asset they own in this whole damn world,” noted Mike Herald of the Western Center on Law and Poverty. …“We’ve turned too many of the police into tax collectors and wonder why they don’t have strong relations with the community,” Norquist said. This is disgusting, particularly because of how the system is a nightmare for poor people. I’m about as far from an advocate of class warfare as is possible, but I can’t help but be sympathetic to the notion that traffic fines should be tied to income. Maybe if the middle class and the rich had to pay fines that confiscated huge chunks of their disposable income, there would be pressure to fix this horrid system. And what’s really outrageous is how the government adds all sorts of fees to the cost of a ticket. It’s deceptive advertising: a $100 fine fronts for an extra $390 in add-ons. The price tag can grow exponentially if unpaid and lead to losing one’s license. The penalty is harsh and crushing on the poor, but these fees also are undeserved for the middle class. If Sacramento wants to levy a $490 fine for moving violations, let lawmakers put honest numbers on their legislation — instead of pretending that the fine is $100. Alas, the Legislature has found that hidden fees are a handy way to finance the court system without voting to raise tax revenue. …If a private corporation advertised a $100 payment for something that really cost $500, California Attorney General Kamala Harris probably would go after the corporation for false advertising. If a credit card company boosted its fees the way the courts do, activists would call those practices usury. If the police yanked people’s driver’s licenses because they didn’t pay a $100 fine, the public would regard such a harsh penalty as excessive force. Yet Sacramento has codified a system that commits all three sins and it’s perfectly legal. Really, is there anything more brutal than government. The good news is that the state is offering an amnesty, allowing some drivers the ability to clean up their record at a reduced cost. But there’s a catch. You have to pay a hidden fee! …there is a $50 amnesty program fee. That’s right — if you want to pay off unpaid traffic fines that have ballooned because of hidden fees, first you have to pay another…hidden fee. I guess coughing up $50 is a good deal if that can reduce other fines by a greater amount, but isn’t this typical of government. Making you give them some money in order to give them more money. Low-income communities also bear the brunt of dubious police tactics. The Washington Post has an in-depth report on how cops are conducting raids against residences even in the absence of any evidence of criminal wrongdoing. Sallie Taylor was sitting in her apartment in Northeast Washington one evening in January 2015 watching “Bible Talk” when…D.C. police officers smashed through her door, a shotgun was pointed at her face and she was ordered to the floor. …Taylor, a soft-spoken 63-year-old grandmother who was dressed in a white nightgown and said she has never had even a speeding ticket. The heavily armed squad thought they were searching the residence of a woman arrested two miles away the previous night for carrying a half-ounce vial of PCP. …The search warrant executed at Taylor’s apartment cited no evidence of criminal activity there. Instead, in an affidavit to a judge, police argued that they should be able to search for drugs there based on their “training and experience” investigating the drug trade. They relied on an address they found in a court-records system for the woman arrested with PCP. In other words, the government can bust into someone’s home, notwithstanding the lack of any evidence, simply because some cop has a hunch based on “training and experience’? I suspect America’s Founding Fathers would not be pleased with this reinterpretation of the Constitution. The Fourth Amendment to the U.S. Constitution protects citizens from “unreasonable searches,” generally requiring government agents to obtain a warrant from a judge by showing they have probable cause to think that they will find a specific item at a specific location. In recent decades, police have been given wide latitude by the courts… Attorney Alec Karakatsanis, of the nonprofit group D.C.-based Equal Justice Under Law, said warrants that rely on training and experience as justification for a search subject the black community to abusive police intrusion based on flimsy investigative work. To make matters worse, the government oftentimes doesn’t bother to confirm addresses before launching these raids. Failure to properly verify an address led police to the home of Patricia Dandridge on Jan. 27, 2015. She returned from work to find her apartment in Southeast ransacked. The door was beaten in and her bed frame was broken, she said. Clothes and personal papers were strewn across the floor. “I thought I’d been robbed, but my neighbor told me it was the police,” said Dandridge, 45. …Three officers had forced their way in to look for firearms. They left empty-handed. The warrant was based on a drug complaint at a housing complex in Southeast more than five miles from Dandridge’s apartment, according to the affidavit police used to justify the search. …Palmer lived down the hall with his parents in Apartment 103. Dandridge lives in 102. “103 does not look like 102,” Dandridge said. The apartments are on opposite ends of the building. Last but not least, Kevin Williamson weighs in at National Review with a withering look at police misconduct and corruption. 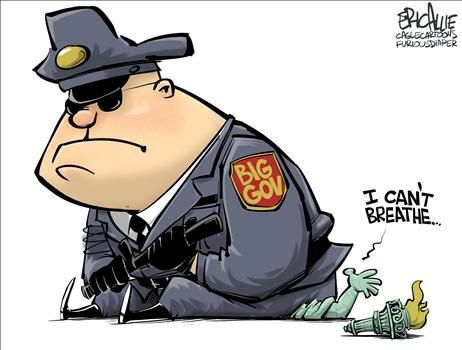 Is it really so difficult to believe that there is widespread wrongdoing, and widespread lying about it, among U.S. law-enforcement agencies, particularly those in big, Democrat-run cities infamous for the corruption of their other municipal institutions? Why do conservatives find it so plausible — obvious, even — that the IRS and the EPA and the Atlanta public schools are corrupt and self-serving, but somehow believe that the Baltimore police department isn’t? He has lots of examples. There are a great many investigations of police misconduct in Baltimore, where the local police behave more like the militia of a third-world warlord than a police agency. …Today, it is the Los Angeles sheriff. Before that, it was the Los Angeles Police Department, whose anti-gang task force became a rolling crime wave of its own, with 70 officers eventually implicated in unlawful shootings, bank robbery, drug dealing, theft, planting false evidence, framing suspects, destroying evidence of their wrongdoing and the usual perjury, perjury, and perjury. Then came Louis Eppolito and Stephen Caracappa, NYPD detectives convicted in 2006 on a raft of charges — racketeering, extortion, drug-dealing, murder and conspiracy to commit murder, running an illegal gambling ring, obstruction of justice — as part of a 20-year crime spree that ranged from New York to Las Vegas. …In Fairview, Tenn., a new police detective was just fired after responding to a prostitution ad. An NYPD officer was awarded $15 million in damages for being kidnapped and beaten inside his own home by other NYPD officers with a score to settle. Honolulu announced that in 2015 it fired a record number of officers for misconduct. Corruption, malfeasance, and misbehavior seem to be a natural part of the system. 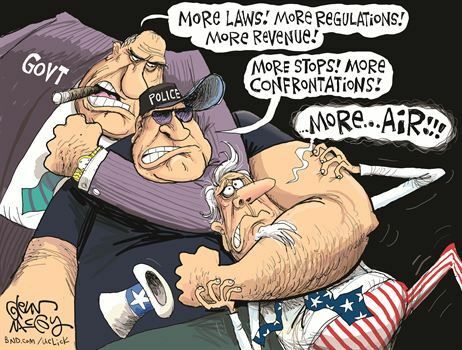 …facts suggest that our police departments have the same problems as our other government agencies, exacerbated by the fact that police are, inevitably, in the business of violence. It isn’t a few scattered misdeeds when it’s the NYPD, the LAPD, the Baltimore PD, the Los Angeles sheriff’s department, and more. That’s not a few bad apples — that’s the orchard. And it needs pruning. Kevin’s argument is very compelling, particularly his appeal to conservatives about being skeptical of all parts of government at all times. This is similar to the argument I made that it’s especially important to monitor and resist government wrongdoing when “the good guys” are in power. In other words, calling for the elimination of the Department of Education or the Department of Housing and Urban Development while Obama is in office is (or should be) the easy part. By contrast, fighting against such wasteful programs when Bush was in the White House was much harder. Many supposed fiscal conservatives suddenly went silent, and that sin of omission helps to explain why the burden of federal spending increased so rapidly. Yes, police protection is a legitimate function of government, so the issue isn’t whether police forces should be abolished (though Camden, New Jersey, got good results by doing exactly that). But skepticism of police budgets and police behavior is still very appropriate. Indeed, one obvious takeaway from Kevin’s article is that it’s especially important for “law and order” conservatives to be vigilant to make sure police forces operate honestly and efficiently (thus making life easier for the majority of cops who simply want to do a good job and protect their communities). And that also means getting rid of laws that don’t make sense. Just as defense hawks should be the ones most critical of wasteful spending by the Pentagon or misguided military commitments by politicians. P.S. You can enjoy some police-related humor here, here, and here. P.P.S. And don’t forget cops generally are on the right side on guns. I think we should have a law or Constitutional amendment that says that any money collected in fines does not go to the government. It goes to a fund to compensate crime victims, or something of that sort. I suspect we’d quickly see enforcement of many laws to plummet, because the government would no longer have an incentive to seek out people who are technically breaking the law while hurting no one. Our likely next President who brags about giving money to politicians for business favors should set a good example of honesty and integrity for the country.